KJGS-2.7 Hollow Blade Dryer is suitable for cooling and drying of pasty, granular and powder materials. It can complete the process of drying, cooling, heating, sterilizing, reaction and combustion under low temperature. The special stirring and heating transferring blade of the machine has high heat transferring efficiency and self-cleaning function. 1. Hollow Blade Dryer is successfully applied in foodstuff, chemical, petrochemical and dyestuff industries etc. 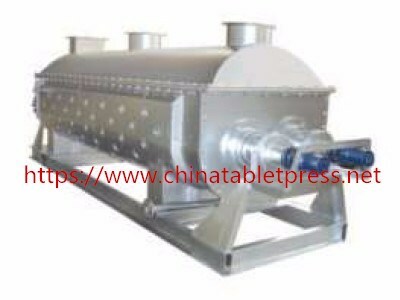 The machine can complete the process of combustion (under low temperature), cooling, drying (recovery of solvent), heating (melting), reacting and sterilizing. The stirring blade is also functioning as the heat transferring surface, so that the heat transfer efficiency is improved and the processing time is decreased. 2. The blade dryer can complete the work of combustion under low temperature with thermal oil functioning as heating media. For example, Ca2SO4·2H2O can be calcined into Ca2SO4·1/2H2O. NaHCO3 can be calcined into Na2HCO3. 3. It can complete cooling process with cooling medium, such as water and chill salted water etc, so that the operating cost can be decreased. 4. It's specially applicable for materials that need to recover solvent and that are inflammable or easily-oxidized. It has been widely used in chemical, petrochemical and dyestuff industries. 1. The energy consumption of blade is low. 2. The cost of the blade drying system is low. 3. The range of materials to be processed is wide. 4. The pollution is little. 5. The operating cost is low. 6. The operation system is stable. Hollow Blade Dryer is suitable for cooling and drying of pasty, granular and powder materials. It can complete the process of drying, cooling, heating, sterilizing, reaction and combustion under low temperature. The special stirring and heating transferring blade of the machine has high heat transferring efficiency and self-cleaning function.